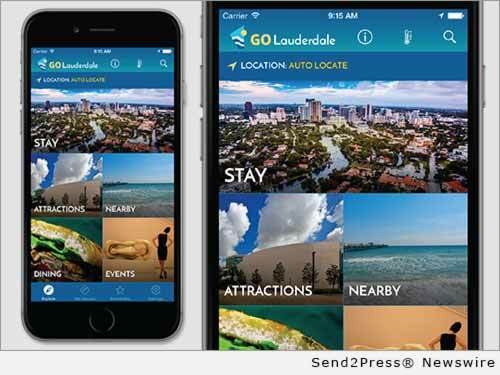 "This system is invaluable for anyone who wants to experience Lauderdale like a local. Like all of our projects at the DDA, it's an essential enhancement to the infrastructure of our great downtown," said DDA urban planner Chadwick Blue. The two organizations are pioneering the first complete multifunction solution that supports Smart and Sustainable Urban Mobility, as well as Travel and Tourism in the city of Fort Lauderdale. The integrated technology suite includes key functional components covering all things Fort Lauderdale: a new website (http://www.golauderdale.org/), smart phone application, and 10 interactive kiosks that will provide the latest information for those looking for what to do and how to get around the city using public transportation. CRG is the prime and only contractor to DDA across the entire initiative. CRG developed the customized Smart City technology, which includes data from Yelp API, Google Places, Broward County Transit, Riverwalk Fort Lauderdale, and the Greater Fort Lauderdale Tourism Bureau (http://www.sunny.org/). The resulting interactive solution, named “GoLauderdale” combines data from various sources into a single, real-time display of information about cultural events, dining, shopping, special offers, attractions, hotels, and transportation options among others. The “GoLauderdale” smart phone app is available on iTunes ( https://itunes.apple.com/us/app/golauderdale/id1053400388 ). The app works offline, thus eliminating roaming/data charges where applicable. Besides finding accommodations, events, dining, attractions and more the app will help enable users to navigate to their destination using the trip planner feature; use bookmarks to help plan the journey; use interactive maps & compass view to find what to do and how to get there. The app also includes Augmented Reality-enabled features such as geospatial search, pointing, and pointing- enabled search. Users will be able to virtually “teleport” to another location to see their next planned stop. This interactive program was initiated to coincide with the Wave Streetcar’s station information and was funded by a grant from the Federal Transit Administration (FTA). Interactive kiosks are available downtown and along the beach. Users can get directions to attractions from their current location using GPS, with interactive mapping that incorporates real-time transit information. GoLauderdale.org allows users to choose from select geographical areas, and the program suggests restaurants and incorporates reviews, menus, current offers, and nearby options. The Downtown Development Authority (DDA) was established as an independent taxing district by Special Act of the Florida State Legislature in 1965 to provide for the rehabilitation, redevelopment, and revitalization of slum and blighted areas in the Downtown Fort Lauderdale. The DDA has played a variety of constructive roles since its creation. It has been, and continues to be, an economic development agency, a redevelopment agency, a marketing organization, and a coordinator and facilitator among various private and governmental entities involved in and with the Downtown. Learn more: http://www.ddaftl.org/. Civic Resource Group International (CRGI) is a leading digital government product company. The Company pioneered CivicConnect™, its first-of-a-kind Mobile/Cloud/Data platform. The Company most recently rolled-out its Augmented Reality-based product for the public sector, CivicAR™. Since 2000, CRGI has been “Fulfilling the Promise of Technology™” for the broad public sector, helping the sector to harness digital advances to connect with their constituents and deliver better and more efficient services. The Company is headquartered in Los Angeles, CA and Dublin, Ireland. In 2015 CRGI was named to the list of Top 20 Government Technology Providers and Top 20 Public Sector Solution Providers along with being spotlighted as “Public Sector Augmented Reality Leader” by Wall Street Forensics. CRG is a new breed of Company with a new signature approach, blending the best of technology, design and communications in the digital age to support Sustainable Communities, Efficient Public Services, Engaged Citizens and Better Quality of Life. Original Keywords: Gregory G Curtin, Yelp API, Google Places, Broward County Transit, Riverwalk Fort Lauderdale, and the Greater Fort Lauderdale Tourism Bureau, GPS Civic Resource Group International Los Angeles California LOS ANGELES, Calif.
REFERENCES: Apple Mac and iOS News, Gregory G Curtin, Yelp API, Google Places, Broward County Transit, Riverwalk Fort Lauderdale, and the Greater Fort Lauderdale Tourism Bureau, GPS Civic Resource Group International Los Angeles California LOS ANGELES, Calif.